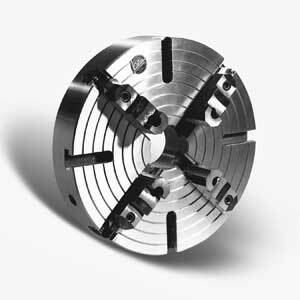 One year warranty  Sizes 12" thru 80"
Size Chuck No. Size Chuck No. Larger sizes available, up to 80" dia., contact PBA for price quotation. Consult factory for 40" and larger sizes. 12" 12.4" 7.874" 3.07" .196" 8.819" M-12 3.86" 2.34" 126 lbs. 14" 13.78" 10.236" 3.07" .196" 11.26" M-12 4.08" 2.34" 165 lbs. 16" 15.74" 10.236" 4.13" .196" 11.26" M-12 3.86" 2.34" 210 lbs. 18" 17.7" 7.874" 4.055" .196" 6.61" M-20 4.33" 3.22" 320 lbs. 20" 19.6" 9.842" 4.055" .196" 8.66" M-20 4.33" 3.22" 415 lbs. 24" 23.6" 9.842" 4.055" .196" 8.66" M-20 4.92" 3.22" 720 lbs. 28" 27.5" 9.842" 4.72" .196" 8.66" M-20 4.92" 3.39" 1050 lbs. 32" 31.5" 9.842" 5.31" .196" 8.66" M-20 4.92" 3.39" 1230 lbs. 36" 35.43" * * * * M-20 * 3.39" 1475 lbs. Dimensions are for flatback-mount chucks; on A, L and D mounted chucks dimension B15 will vary. *Specify when ordering. “L” type mounts available upon request. (1) B4 are standard thru-holes. Thru-holes can be larger upon request. All A-11 mount chucks have 6.5" thru-hole as standard.